Buffalo River Landing represents the next chapter of a historic site that once held the Erie Freight House, a circa 1860s warehouse from a pivotal period in Buffalo’s past. Freight houses such as this handled and stored cargo from the shipping trade so critical to the growth and development of the city. Abandoned for decades, the freight house fell into a state of disrepair that made its safe rehabilitation impossible. Buffalo River Landing kicks off a rebirth of the site that honors its historical significance. As part of the plans, the freight house’s brick foundation will remain and be visible from the water’s edge. 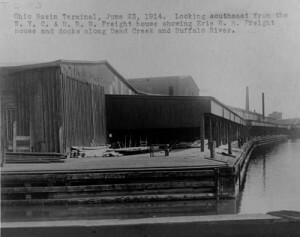 An agreement has been reached with Preservation Buffalo Niagara on a protocol for the salvage, inventory and storage of remnants of the Erie Freight House for possible reuse or repurposing at another time and place.